"This homemade liqueur recipe originates from the island of St. Michael in the Azores. It is a family favorite at Christmas time." 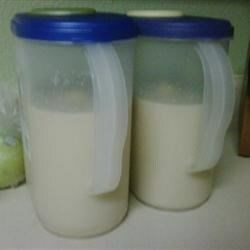 In a gallon container combine whiskey, lemon, sugar, milk, chocolate squares and vanilla beans. Keep at room temperature for 10 days, stirring once a day. After 10 days, remove the lemon half, chocolate and vanilla beans. Insert a coffee filter into a large funnel. pour the liquid through the filter into a gallon jug. Change filter as needed. A clear yellow solution should result. This liqueur can be stored in a sealed bottle at room temperature.